unless noted all art it by Matt Crane. High Concept: A maze game in which the player assumes the role of a rocket-powered hamster test pilot who must navigate a gigantic habitrail from hell in order to thwart the plans of an evil scientist and regain his rodent freedom. Hook: The look and fast paced action of Virtua Racing and Virtua Fighter combined with an amusing puzzle strategy game and an unlikely group of heroes and enemies. The majority of the game takes place in a mad scientists lab facility. The scientist has assembled a truly humongous habitrail-type maze in order to test his rocket powered rodent experiments. The rocket back packs that the characters wear in the game are all prototypes and were custom built for their rodent pilots. They are all unique in appearance but they share the attributes of being high performance rockets that are difficult to stop once started. The pilots do have the ability to divert power to the retro rockets in order to brake or, in some cases, to travel in reverse but for the most part the characters are in constant forward motion. The pilots all ride some form of skateboard. In order to steer the rocket, the pilot leans into turns with the skateboard. These tiny skateboards are similar to “Hot Wheels” in that the wheels create almost no friction or traction, this can get a pilot into trouble if he gets broadsided in an intersection- the lack of traction can make the board and its rider spin out of control. Recognizable as a turnable tube by it’s ‘warning stripe’ pattern. Banking your skateboard onto the wall of the tube just before the turn will cause the corner to rotate so that you can complete your bank. If you don’t have enough speed when you make a jump you either end up in a less desirable part of the maze or you hit the floor. Once on the floor you’ll be eaten by the mad inventors cat if you don’t make it to one of the maze entrances quick. Player One is a test pilot hamster from a rival lab and was stolen by the mad scientist. Player One’s goal is to retrieve all of the stolen blue-print pieces and escape from the lab. The hamster pilot has to navigate the complicated maze as well as fend off evil rocket riding rodents, a mechanical snake, and the scientists voracious cat. He relentlessly patrols the maze; clicking and whirling, sniffing out rouge rodents and disposing of them. After a meal he loses a certain amount of agility and speed due to the hamster size lump he’s sporting. He can’t turn around in a tube but he can find ways to get behind you if you tail him for too long. If you can trick him into dropping out of the maze and onto the floor, he is susceptible to the inventors voracious cat- the cat can’t eat him but he can pick up and carry him away for a little abuse. The cat patrols the entire building looking for tasty rodents who have escaped the maze. Once he gets a hold of you, you are doomed. 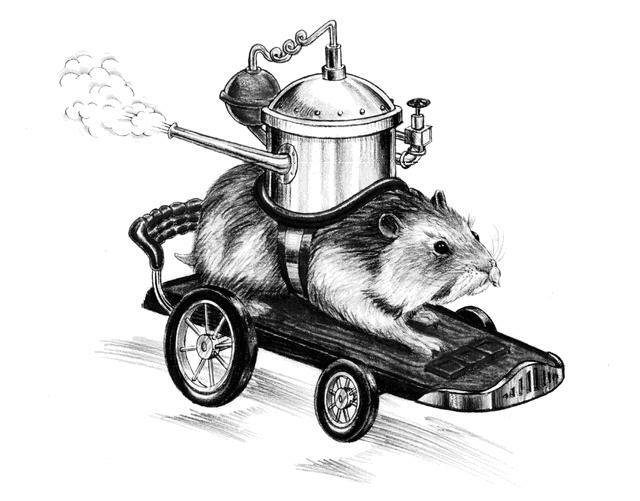 an old hamster sporting a steam powered 'Model-T' type rocket. He befriends the hamster pilot and helps him to collect blue-print parts. The opponents actively try to stop you from collecting blue-print parts. If they slam you from the front or side they will take the last blue print section you acquired and run off with it. and a pack of alley rats with black leather and chrome rockets. Enables you to break through barriers and squash snake like an accordion. Must have drag chute in order to come to a full stop. Stops burst of speed when in tubes and works like a parachute if deployed during a tube to tube jump or table top leap. Boosts the power of your reverse rockets so that you can propel yourself backwards if you use them in the right situation. Can be used like the regular retro rockets to heat up and pop corn kernels in order to create a Popcorn Barrier. A squeal so loud it momentarily stuns any other rodent within hearing distance (they role on their backs and twitch.) No effect on snake but he'll go for a stunned rodent before he goes for you. Harpoon like device that launches from back pack and saps energy from opponents, works on the snake too. Store 'em in your cheeks and shoot 'em at your opponents' butts. Using your Retro Rockets to propel you backwards lets you shoot oncoming opponents in the face as well. No effect on snake. Chew it up, blow a bubble and spit it out in a blind curve to catch your opponent in a sticky mess. The longer you blow (by holding down the A button)- the bigger it gets. Small bubbles grab wheels of opponents skate board and send him flying. Big ones completely envelope an opponent and stop him until he can clean it off. Large bubbles also slow the snake. You can't spit seeds while you have the gum in your mouth. Eat one and become so hyper that you’re invincible. Can’t be stored in cheek pouches. Rodents wipe out if they hit a snake-oil slick. The mechanical snake leaves slicks from time to time randomly. the eat button to chew through. from the lab. The game is over when all of the players lives are used up, i.e. all of his pilots have been eaten. The game shifts between first person and third, person views. 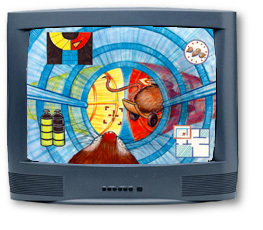 While in the tubes the point of view stays in the first person, the player sees through the hamsters eyes and his Heads-Up Display, but anytime the player leaves the maze, like during jumps between tubes or hitting the floor, the POV shifts to third person. Real-time rendered polygons similar to Virtua Racing and Virtua Fighter. the fist-person point of view, you could also choose to be behind the character. This is my version of the maze with Chip and the snake. The broken tubes would allow the players to get out of the maze but then they were vulnerable to the lab's cat. Chip the hamster, originally named Buzz, after Buzz Aldrin, and renamed after the upcoming Toy Story was found to have a main character by the same name. I thought he should have a test pilot name, that led to nicknames since all the famous test pilots seemed to have nicknames. 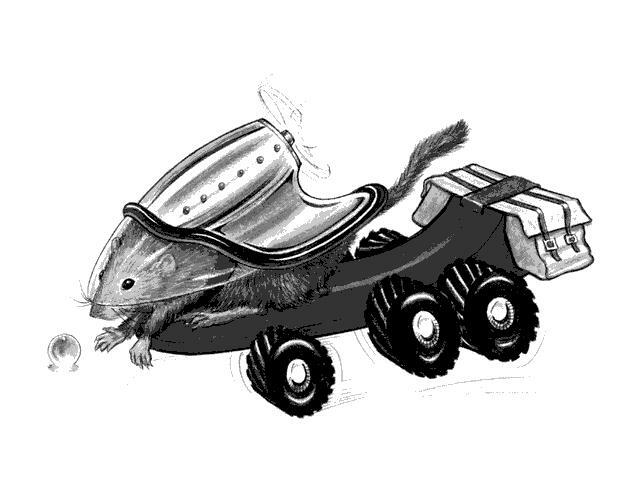 This was the first design for the packrat, I liked the cool jetpack but the character and board needed to look more basic and to focus on the object collection/hoard. 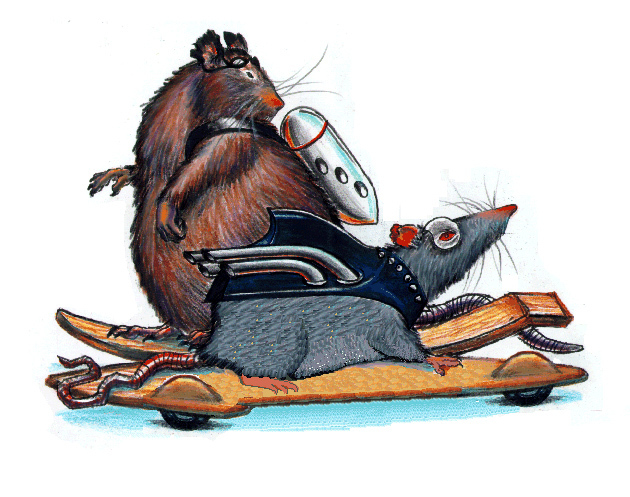 The Oldster Hamster, I love the jet pack and old fashioned board. There was a plan to have several rats that acted together but the idea was trimmed down to just Thorn. 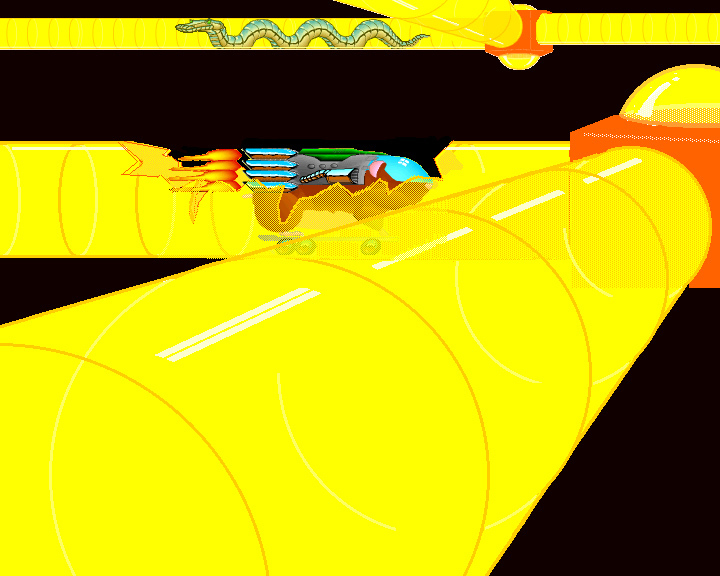 The Mechanical Snake, one of my few artistic contributions. Chrome was my thing. All images and product names are copyrights or trademarks of Sega Of America, Inc.